Commencing life as a section of London Telecoms Region, West Area Sports and Social Club it was started in 1970 by Jeff Simmons. The first boats were Jeff and Barbara Simmons' and were all lathe and canvas, both doubles and singles. Long distance touring became the thing, their mileage at that time being 25 miles per day up to a maximum of 40. In September 1973 someone obtained the entry form for a long distance race on the River Wey and six of them entered, obtaining creditable results. This started an interest in marathon racing which still continues. In the days when clubs gave trophies for top scoring clubs in races they had several good wins. 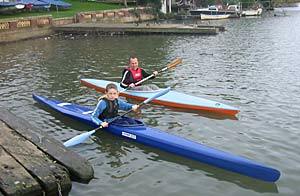 In the early to middle 80s the club organized several paddling holidays on the canals and rivers in France and this was repeated in the late 90s and on to 2005. In 1978 the Surrey and Hants Canal Society asked the club to publicise the Basingstoke Canal and they ran the Westel Tourist Trial which had 500 entries which was the largest of any event at that time, and it only ended in 2004 as paddlers interests changed. 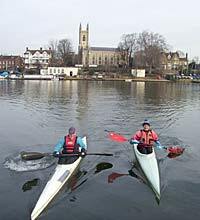 The Devizes to Westminster race has always held a fascination for the club and for many years they fielded teams of doubles, then more recently it has been in the four day single class. One member has paddled it 11 times in various classes. From 1970 to 87 they operated from a garden in Ashford, and then they had the offer to join up with Thames Canoe Club on Platt's Eyot. In 1988 the Thames Club became moribund and offered them the Clubroom. They took over the rental. Then Developers took over the island and put up the rent by a factor of 20 so they were looking for a home again. With the discovery of the Hampton Pumping Station and help from the Sports Council and Richmond Council and some hard work they were back in business again. For several years the interest in divisional racing waned and touring and recreational paddling became the mainstay. Then our junior section began to build in numbers and under the encouragement of Martin Norman enthusiasm grew for racing again with several senior paddlers taking part. Since the nineties we have had many juniors in International training squads and who have raced on the Continent. Currently we have two juniors who are regularly taking part in international racing. 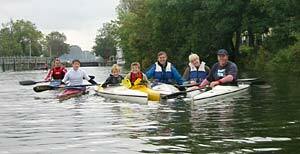 Our touring program is full with a run every weekend and recreational paddlers are on the water at all times.